Abdel Fattah al-Sisi came to power in July 2013 through a military coup, supported by many sectors of Egyptian society that wanted to rid themselves of the religious rule imposed by Mohamed Morsi's Muslim Brotherhood government. Yet religion has loomed large in Sisi's identity, from a 2006 research paper written while studying at the United States Army War College, to his consistent emphasis in speeches and interviews on the importance and necessity of religion, and his direct presidential responsibility for protecting religion and morality in Egyptian society. Has Egypt exchanged one religious regime for a similarly disposed but Salafist ruler? Egyptian president Abdel Fattah al-Sisi came to power in 2013 through a military coup against the religious rule of the Muslim Brotherhood. Raised a devout Muslim, religious influences significantly shape Sisi's worldview. Has Egypt exchanged one religious regime for another? To understand Sisi's personality requires looking at his origin and background. The future president was born in November 1954, in Cairo's religiously-suffused Gamaliya neighborhood. The area is one of the most ancient neighborhoods in the city, going back to the Fatimid era, containing the oldest and largest mosques in Egypt such as al-Azhar and Hussein mosques. Sisi's father, Said Sisi, worked in manufacturing, but he originated in Monufia, a governorate located in the Nile Delta, best known for men who join the armed forces, including former generals and presidents Anwar Sadat and Hosni Mubarak. Abdel Fattah was raised in a devout Muslim family. His father was a religious conservative who followed the Sufi al-Ahmadiya (Badawiya) order. According to some sources, Said was the Badawiya leader in Gamaliya while the young Abdel Fattah was a follower of the same Sufi method. In an interview with al-Ahram newspaper, Sisi said that his father gave him a silver ring with a black stone, famous among Sufis and religious Muslims because, according to Islamic practice, they cannot wear gold. Though not his eldest son, Sisi's father gave him the ring, evidence that he knew that his son would regard it the same way. In childhood, Abdel Fattah went to Qur'an school in a mosque near his home. His religious devotion was deep: He would often wake his family to attend prayers at a nearby mosque. He also frequented al-Azhar Mosque to attend Sheikh Ismail Sadiq Adawi's lessons and has said that the sheikh, a Sufi leader, had a profound influence on his personality. He also attended Hussein Mosque for Sheikh Metwali ash-Shaarawy's lectures. Shaarawy was not a Sufi follower but had something else in common with Adawi: Both were followers of Muslim Brotherhood founder Hassan al-Banna. Shaarawy even wrote the Brotherhood's first statement. These early experiences contributed to Sisi's personality, convictions, and vision of religion. It is also noteworthy that Sisi does not like to sing or go to movie theaters. His conservative background and Sufi influences cannot be overemphasized. The religious identity of the Egyptian armed forces has been clear since their reformation after the July 1952 coup d'état. At base, it is an Islamic army, with religious ideology constituting an important element in its orientation and decision-making. Its leaders continue to believe in the principles of the July 1952 regime, founded by officers imbued with Muslim Brotherhood principles. This harmony between the Egyptian military and the Muslim Brotherhood is not a coincidence as the Free Officers Movement, which organized and carried out the 1952 coup, began as a Brotherhood cell. Most of the Free Officers figures who became members of the Revolutionary Command Council (RCC), such as Gamal Abdel Nasser, Kamal ad-Din Hussein, and Khaled Muhieddin, had offered their allegiance to the Brotherhood in early 1946. The movement also served as an extension of the Brotherhood's military wing (at-tanzim al-khass), representing it within the Egyptian armed forces. Gen. Saad Shazly, the armed forces' chief-of-staff during the October 1973 war, made this explicit in a booklet written a year before the war titled "Our Religious Creed Is Our Way to Victory." In it, he used Qur'anic verses to urge soldiers to fight the Jews according to Islamic beliefs, reminding them that the Egyptian armed forces were Islamic, with jihad as their purpose. The booklet is strikingly consistent with ideas voiced by Muslim Brotherhood ideologue Sayyid Qutb in a series of articles written in the early 1950s. 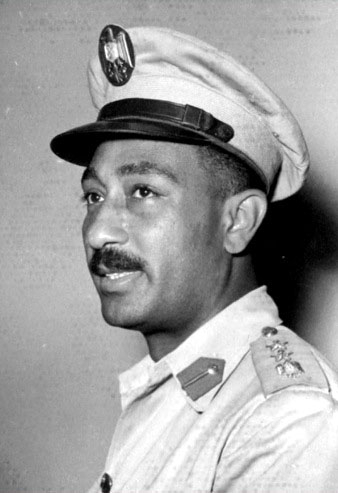 Following the incarceration and execution of Islamists during the Nasser presidency, Anwar Sadat (above), Egypt's president from October 1970 until his assassination in 1981, restored the Islamists to the public domain and made Islamic law the main source of legislation. However, once in power, the officers fell out with their parent organization, which sought to exploit the coup to gain control for itself over the levers of power. Following the breach, the Brotherhood attempted to assassinate Nasser in 1954 and sustained a terror campaign against the military regime. These activities resulted in the incarceration of thousands of Islamists and the execution of scores, including Qutb who had masterminded the movement's violent campaign. This rivalry, however, did not prevent the inculcation of generations of Egyptian officers with religious principles. If the movement was stymied by Nasser, it was revived under the reign of Anwar al-Sadat, who not only restored the Islamists to the public domain but also made Islamic law the main source of legislation. One of the movement's leaders was Sheikh Shaarawy, who had earlier played a role in shaping Sisi's religious outlook. These changes came to the fore with renewed vigor in the wake of the January 2011 revolution and the new leaders who ruled Egypt, most notably Sisi. The military's Islamic lineage is vital for understanding Sisi's views on a number of issues. He joined the armed forces in 1970 at age sixteen, attending the Military Air Force High School and then the Egyptian Military Academy, where he graduated in 1977. He was part of a new generation of military men who hailed from conservative religious backgrounds and/or tended to strict interpretation of religion, inspired by the Islamic Awakening (as-Sahwa al-Islamiya) that swept Egyptian society. A rapprochement exists between Sisi, the armed forces, and the Islamists; Egypt's attitude to the U.S.-proclaimed war on terror and post-"Arab Spring" democratic transformation help illustrate this point, for all of them see Washington as trying to destroy Islam and conquer Muslim countries. Sisi sees the wars in Iraq and Afghanistan as reducing the chances for democratization in the Middle East and the Arab world. He regards these wars as a cover for imposing profoundly ill-suited, Western-type secular democracy on Islamic nations. These views resonate with fellow Islamists, who view secularism as the greatest threat to Islam. Like the Brotherhood's Qutb, Sisi rejects the comparison of an Islamic regime with any other, such as a socialist or democratic system, because a divine system cannot be compared with anything constituted by humans. Qutb also believes that Islam presents a complete and integrated system, which benefits from shura (consultation). Here, Sisi's views again coincide with the Islamists': shura and the caliphate represent democracy appropriate for Muslims, who should not emulate the West. Sisi also believes that religion should remain the main regulating framework of the legislature, judiciary, and executive branches, rather than be considered a separate authority or source. In his view, to ensure that the three powers will work according to an Islamic framework, the constitution must explicitly state this, which is now the case with the Egyptian constitution declared under his auspices in 2014. When governments become excessively powerful, the oppressed may respond through terrorist acts. The occupied territory in Israel is a good example. Because the oppression exists, a fertile environment is created that ultimately leads to extremist movements. This attitude is also reflected in Sisi's anti-Israel rhetoric in his address on the forty-fifth anniversary of the October 1973 war—despite Jerusalem's considerable support to Egypt's fight against Islamist terrorism in Sinai—and in his benign aloofness to the media's ongoing anti-Israel incitement. When Sisi announced the overthrow of Mohamed Morsi and the end of the Muslim Brotherhood regime on July 3, 2013, religious rule was widely seen as having ended. But it had not. Sisi's real piety, ideas, and actions are quintessentially Salafist. His 2006 paper illustrates this basic tendency, as do many of his recent public statements and actions—despite his care not to reveal his Salafist inclinations. When Sisi surrounded himself with figures representing the Egyptian people and public opinion, Galal al-Morra, secretary-general of an-Nur political party, represented the Salafists. What was the leader of a religious party, founded after the January 2011 revolution as the political wing of the Salafist Call, doing there? Nur's objectives do not differ much from the dissolved Muslim Brotherhood in that both seek to apply the Shari'a and Islamize all aspects of life. Sisi invited Nur to stand by his side for two main reasons. First, Egyptians remain positive about Islam, and Nur protected him against the inevitable Brotherhood attempt to incite public opinion against him by portraying Morsi's overthrow as a war on Islam. He needed a non-official representative of Islam to defend him and polish his image. Second, Sisi did not allow supporters of the secular civil state or Copts to demand any changes to the Egyptian state that challenge its Islamic identity. He wanted, in particular, to reject the many demands to change the constitution's second article, which states, "The principles of Islamic law are the main source of legislation." Salafis are ideally placed to confront such challenges and thwart efforts to establish a civil state; this was confirmed by the proceedings of the Fiftieth Committee, which was tasked with amending the constitution. According to Muhammad Abul Ghar, a committee member, as a result of the deal between the Salafis and the Egyptian military, Islamists successfully resisted any attempt even to mention the secular nature of the Egyptian state. 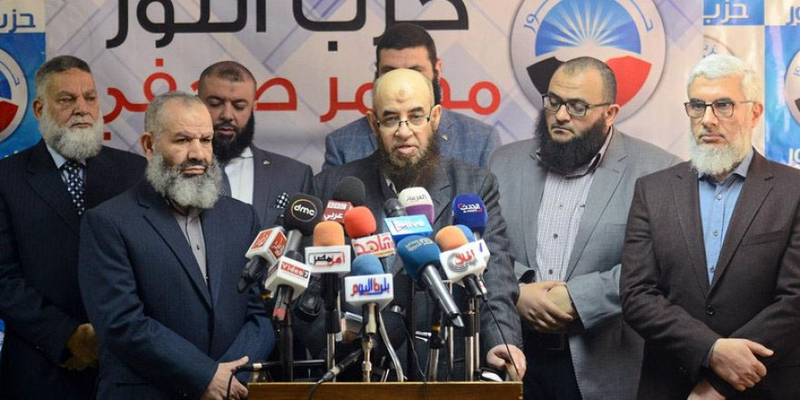 Leaders of al-Nur, a Salafist political party, supported Sisi's election in 2014 and 2018. Nur's objectives do not differ significantly from the dissolved Muslim Brotherhood's in that both seek to apply the Shari'a and Islamize all aspects of life. In turn, Sisi provided Nur with protection, which it needed because its very existence contravenes the constitution, which prohibits the establishment of a political party on a religious basis. On these grounds, the Supreme Administrative Court dissolved the Brotherhood's political arm, the Freedom and Justice Party (Hizb al-Hurriya wa'l-Adala); in another decision, however, it granted Nur the right to exist. Sisi even argued that Nur's activities "enrich the democratic life in Egypt." 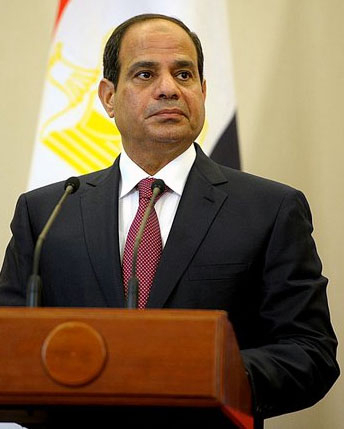 In a January 2015 address to the sheikh of al-Azhar and other sheikhs and imams, Sisi demanded a religious revolution that would revise Islamic traditional beliefs and ideas. He reminded his listeners that it was illegitimate for Muslims to cause death and destruction throughout the world. The speech was warmly welcomed in the West where many viewed Sisi as an Islamic reformer, who would bring hoped-for changes in the region. Far from it: Sisi's address was mere propaganda directed at Western and other public opinion while al-Azhar and the Salafis gained increasing dominance over many aspects of Egyptian life. Most of al-Azhar's scholars, imams and preachers adhere to Wahhabism, a branch of Salafism, so, contrary to its reputation, al-Azhar is not solely in the hands of the Muslim Brotherhood. As a state institute, al-Azhar has filed lawsuits against figures such as writer Islam Behery and Sheikh Abdallah Nasr, who urge religious reform and oppose Salafist ideology and were subsequently imprisoned. Liberal journalist Ibrahim Issa's television show, where he revealed connections between the teachings of al-Azhar and Salafism on the one hand and Islamic State (ISIS) on the other, was cancelled. Other individuals have been accused of infidelity and blasphemy. As these battles over Islam raged, Sisi dispatched his interior minister, Magdi Abdel Ghaffar, to al-Azhar to proclaim the state's support. With this, he signaled that the interior ministry, the most prominent face of repression in Egypt, would suppress any moderate voices criticizing al-Azhar and Salafist extremism. Subsequently, many of Sisi's al-Azhar supporters—including Salem Abdul Jalil and Usama Rushdi—in addition to Yasser Borhamy, vice president of the Nur Party appeared on television to vilify Christians and Jews. Despite many lawsuits by human and civil rights lawyers and activists against these supporters, no trials have taken place; the judiciary embraces the same Salafist views. 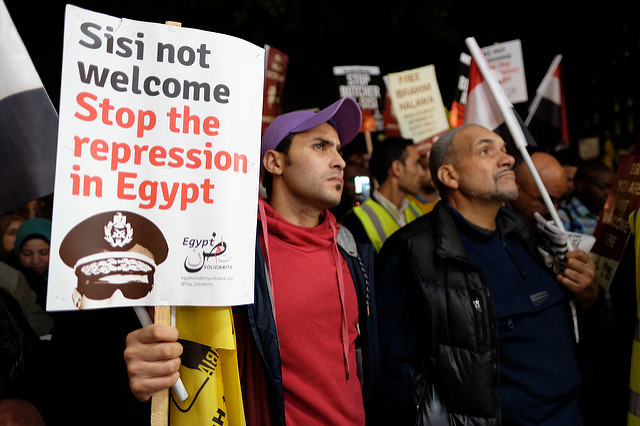 Demonstrators protest against Sisi's visit to London, November 2015. Under Sisi, the Egyptian state has used all means of communication to silence voices calling for civil society and democracy. Dissenters urging religious reform and opposing Salafist ideology have been imprisoned. Under Sisi, the Egyptian state has used all means of communication to silence voices calling for civil society and democracy, leaving the arena wide open to advocates of Salafism. Sisi also supports decisions that tighten the religious grip on society. As part of the regime's ostensible fight against Islamist terrorism, it established "fatwa kiosks" in subway stations, offering religious rulings to the millions of Egyptian passengers using the subway system every day. This experiment was ended without any explanation after the issuance of a number of controversial fatwas, most likely because Sisi was reluctant to expose the regime's real Salafist face. Sisi's ideas and actions clearly reflect Salafist influences; he sees Islam as society's foundation and considers it his responsibility as ruler to insure this vision. This explains why he has stated that the caliphate—merging political and religious authorities—is ideal for Muslim countries and why he rejects democracy as a form of Western secularism. Given Sisi's Sufi inclinations, one might call him a "Salafist dervish." Sisi also represents the face of the Egyptian military, which sees itself as an Islamic army. The conflict between the military and the civilian Islamists is a struggle for power. That is why Sisi overthrew the Muslim Brotherhood; had they remained in power longer, they would have purged the military of its political and economic centers of power. To ensure a façade of continuity, Sisi presented himself as an alternative to the Brotherhood; yet he was careful to position himself as an alternative that combines both military and religious power. In this way, the president is establishing an authoritarian, military, Islamic, Salafist state. Ramy Aziz (@Ramy_Aziz1) is a research fellow at the Institute for the Study of Global Anti-Semitism and Policy (ISGAP). He is currently a visiting fellow at the Ackerman Center for Holocaust Studies at the University of Texas at Dallas, focusing on the emergence and evolution of political Islam in Europe. Brig. Gen. Abdelfattah Said ElSisi, "Democracy in the Middle East," U.S. Army War College, Carlisle, Pa.; on which, see Daniel Pipes, "What Egypt's President Sisi Really Thinks," Middle East Quarterly, Fall 2014. Al-Bawaba News (Cairo), June 7, 2015. Al-Ahram (Cairo), May 17, 2014. Al-Watan (Cairo), Aug. 24, 2013. Soutalomma (Cairo), Sept. 11, 2015. "Sisi: Mutabati li'l-Sheikh ash-Shaarawi fi'l-Segar Shakl Shakhsiyati," You Tube, May 5, 2014. Khaled Mohieddin, Wa'l-An Atakallamu (Cairo: al-Ahram, 1992), pp. 45-6; Ida'at (Cairo), Oct. 1, 2018. Saad Shazly, Aqidatuna al-Askariya Tariquna li'l-Nasr (Cairo: Ministry of Defense, 1972). Sayyid Qutb, Ma'rakatuna Ma'a al-Yahud (Cairo: Dar ash-Shuruk, 1988). Adel Darwish, "Obituary: Sheikh Muhammad Mutwali Sharawi," The Independent (London), June 18, 1998. Gilad Wenig, "Egypt's Army of God," The Washington Institute for Near East Policy, Washington, D.C., Nov. 4, 2014. Islamway website, Feb. 28, 2010. Eric Trager, "Portrait of the General as a Not-So-Young Grad Student," Foreign Policy, Aug. 7, 2013. ElSisi, "Democracy in the Middle East." Sayyid Qutb, Al-Adala al-Ijtima'iya fi'l-Islam (Cairo: Dar ash-Shuruk, 1995), pp. 75- 86. Haisam Hassanein, "Sisi's Anti-Israel Rhetoric: New Speeches, Old Problems," The Washington Institute for Near East Policy, Oct. 17, 2018. "Abul Ghar: al-Jaish zawara nass al-Dustur," You Tube, Dec. 16, 2013. Reuters, Aug. 10, 2014; Daily News Egypt (Cairo), July 5, 2015. Daniel Pipes, "Sisi and the Reform of Islam," National Review, Jan. 19, 2015. Mada Masr (Egypt), Dec. 29, 2015. Ramy Aziz, "Sisi's Religious Revolution Falls Flat," The Times of Israel, Apr. 20, 2015. Five Pillars (Britain), May 12, 2017. The Guardian (London), Aug. 1, 2017.